Hundreds of teams fell in the massive multi-week Heroes of the Storm tournament, Heroes of the Dorm, before it launched into its semi-finals round last weekend. 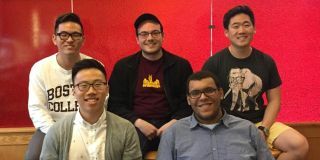 We won't give spoilers here, but Boston College, Arizona State, University of Illinois at Urbana–Champaign, and Cal Berkeley duked it out in amazing set of games to decide which students never have to worry about their college tuition again. Students on the winning team got the rest of their college tuition paid for by Blizzard! These four teams were relatively unknown before ESPN's epic broadcast, as the previous stages of this massive tournament were held online. So we got in touch with each of them to find out who they are and what their team is about. An eager team formed around a few small groups of friends. They make sure to keep school their first priority, but practice heavily once schoolwork is done. A serious team of gamers who are all familiar with playing in competitive settings. They united online to create the most viable roster their school could offer. Why root for them: Their team's experience in many competitive gaming tournaments, as a group and individuals, should help them stay focused during the tournament's first in-person matches. Two teams merged into one mega-team, united by dreams of winning the tournament while keeping a lighthearted attitude. They're new to competitive gaming, but quickly making a name for themselves. Why root for them: They're the underdogs in the tournament! They barely snuck into the group stage of the tournament and have won most of their matches 2-1 so far. An experienced team of esport-hopefuls that have played together through many different tournaments and games before. They've even got a pro Heroes of the Storm player on their squad. Why root for them: Fan is a pro player on Cloud9's professional Heroes of the Storm team, was Rank 1 on the ladder when the tournament was announced, and is a big part of the reason why they're favored to win the tournament. Oh, and you should root for them to support Suppy's random outbursts of singing along with the music during matches. If you missed the epic matches on ESPN, you can watch the replay and other videos on the Heroes of the Dorm website.